The Norfolk Botanical Garden has grown from humble beginnings as a Work Progress Administration project to a 175-acre garden filled with thousands of plants. There are more than forty themed gardens featuring collections of Camellias, Crepe Myrtles, Hydrangeas, Hollies, Rhododendrons/Azaleas, and Roses. Other noteworthy collections include Begonias, Conifers, Irises, Magnolias and Viburnums. The garden has over 12 miles of paved trails and 300,000 visitors annually. The Garden’s mission is to enrich life by promoting the enjoyment of plants and the environment through beautiful gardens and education programs. Norfolk Botanical Garden is known for its extensive plantings of azaleas, but camellias have been an important part of the Garden since its founding in 1938. The Garden’s first director, Fred Heutte, intended “to gather the finest collection of camellias ever presented to the American public.” Every year, the Garden continues to enhance the collection by adding more varieties and species of camellias. The collection now consists of more than 1600 accessioned plants representing 1200 different types. The NBG is working to increase its collection of ancient varieties cultivated before 1900, species Camellias, and dwarf and groundcover forms. The Virginia Camellia Society plays an active role in helping to maintain and improve the collection. Society members conduct public workshops on care and propagation of camellias using the Garden’s collection for examples and resources. 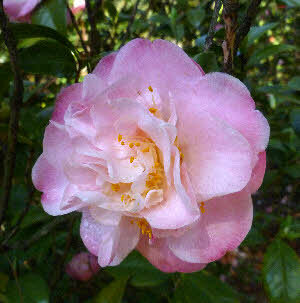 Visitors will find camellias throughout the Garden, but the vast majority of the collection can be found in two places. 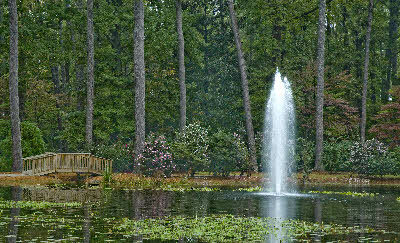 The original plantings of camellias can be found in the historic Mirror Lake area and along the entrance road. The second core of the collection is found in the Hofheimer Camellia Garden, created in 1992 in memory of Alan J. and Aline F. Hofheimer, founding members of the Virginia Camellia Society. This garden includes almost 500 different types of Camellia japonica, more than 20 different types of Camellia sasanqua and more than a 100 other species and hybrids. In the late 1930’s, Norfolk gardener Mrs. Lyman (Evelyn) Clarke registered a new camellia seedling with the American Camellia Society because of its very different deep rose pink on the petal edges blending into white at the base with large double-peony flowers. The original plant thrives here at the Garden.